CARE International is a global confederation of 14 member and 4 candidate/affiliate organisations working together to end poverty. 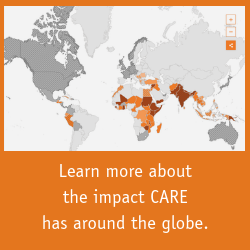 In 2018, CARE worked in 95 countries around the world, implementing 965 poverty-fighting development and humanitarian aid projects. We reached more than 55 million people directly and 340 million people indirectly. Unable to load twitter timeline, please enable cookies.